Having children has taught me several things, one of those is to ALWAYS have food and snacks - no matter where we are. I keep a few snacks in my purse and we have a snack bag (lunch box) filled with snacks in our vehicle at all times! Peter Rabbit Organics fruit and veggie puree pouches make eating fruits and veggies fun for kids! You can easily "squeeze" the fun right out of each pouch! There’s no need for a spoon, no risk of spilling food... and you can reseal it for finishing later. Plus, each fruit pouch contains a full serving of fruit and each veggie pouch contains 1 of 5 daily servings! The thing that stands out most about Peter Rabbit Organics fruit and veggie puree pouches is that they are all organic, contain 100% fruit and veggies, and never have added sugar or anything artificial. What you see on the front is what’s inside! If you do read the label you’ll see your snacks are high in vitamin C, between 70 and 85 calories, 0 fat and 1.5-2 grams of fiber. 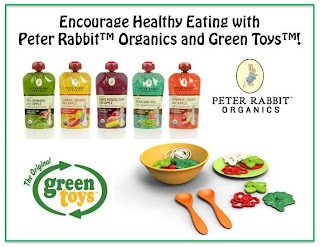 For added convenience, Peter Rabbit Organics don’t require refrigeration before eating and come in BPA-free resealable pouches for easy packing. 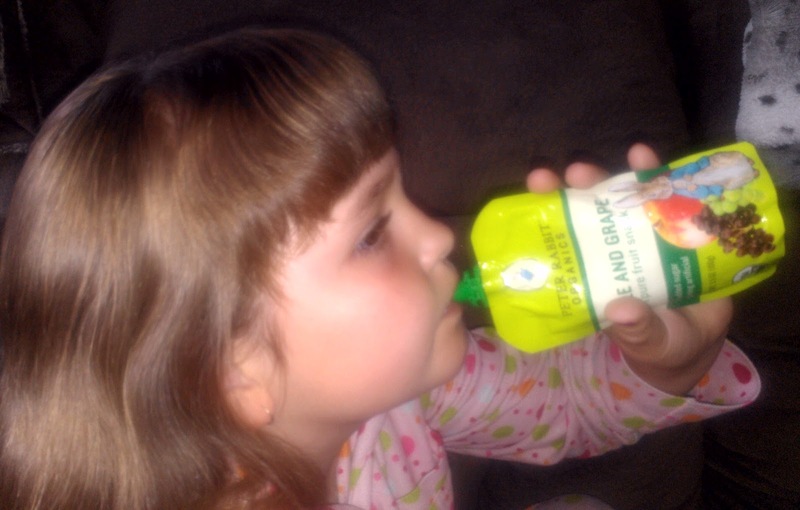 Plus, the convenient, squeezy pouch (with a no-choke cap) makes it fun and easy for little hands! This also makes them perfect for on-the-go - keep them in your car, diaper bag, or even in your purse! 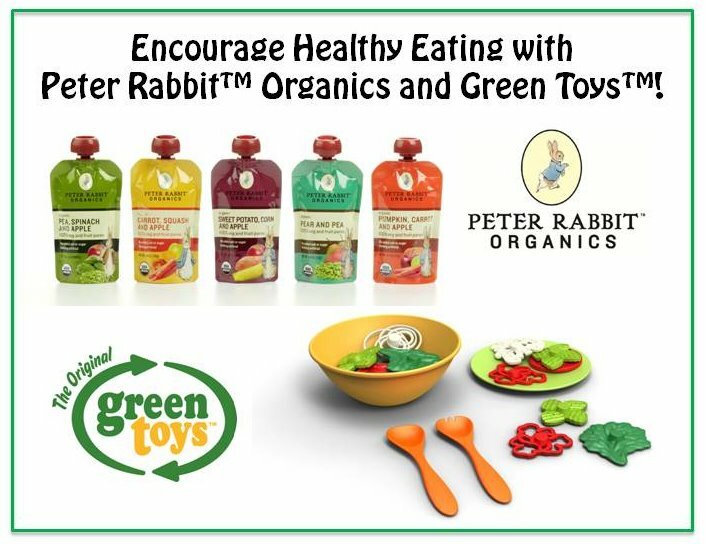 You can find Peter Rabbit Organics fruit and veggie puree pouches at Starbucks nationwide, in select Whole Foods Markets, Publix and Albertsons, and natural food stores, in all Buy Buy Baby stores, and online at Amazon.com, Target.com. Diapers.com, BabiesRUs.com and Spud.com. Disclaimer: I received complimentary organic baby food pouches from Peter Rabbit Organics for the purpose of writing a review and hosting a giveaway. Regardless, I only recommend products or services I use personally and/or believe will be a good fit for my readers. The views and opinions expressed on this blog are purely my own. Results may vary. No monetary compensation was received. I would like to feed my son the mango banana orange fruit one. Pea Spinach and Apple Blend! The Mango, banana, and orange looks yummy! I'd like to try the Pumpkin Carrot Apple blend. I'd like to try the Pea, Spinach and Apple blend. Mango bannana orange sounds okay! Sweet potato would be great for my niece. I'd LOVE strawberry banana for my toddler! My son would love the peach & apple pouch! Mango bannana orange ! My son loves anything Mango flavored.